Plenty going on at the moment, which has left me trying to find the organising equivalent of Hermione Grainger’s magical Time Turner gadget to fit it all in. Most pressing at the moment has been compiling and operating the sound effects for Bolton Little Theatre’s production of the WW1 play “Private Peaceful” Running 10th – 17th November 2018. It’s the story of Tommo Peaceful, a British Army private facing the firing squad for mutiny. As he waits for the dawn, he looks back to his childhood in the Sussex countryside and his hellish experiences in France. As sound design I have created a trailer as well. It’s always interesting to find the effects and then edit them to fit the director’s intentions. Not all my sounds are authentic to the period but they fit the model of what the audience will expect to hear on a battlefield. When I was first learning audio drama production, I soon appreciated that there are certain conventions about sound, such as arriving lifts which ping ,that are vital shorthand in telling a story. However whilst its good to keep my audio skills fresh and to help create a theatrical play, I do intend to pull back from this kind of role for a while after Private Peaceful has finished. Why? Because there is plenty going on elsewhere. For a start I have begun a part-time degree called BSc(Hon) Digital & Technology Solutions Apprenticeship at Manchester Metropolitan University. I do believe that decisions and people can connect in unexpected but beneficial ways. So although there is not an obvious crossover between fiction writing and programming / web development / business information systems, part of me thinks what has started as an opportunity to update and increase my technical knowledge, might help my creativity nous too. Recently I was approached by my old friend Nigel Anderson, director of Angel Snow amongst others, too take part in a new exciting project. Six Million Voices is a short film inspired by the classic book about the Holocaust – The Diary of Anne Frank and is being made in cooperation with the Anne Frank Foundation. It is built around the album of music and narration produced by Chris Williams. You can listen to some of her music via her Soundcloud page. I have been asked to play Anne’s father and the founder of the organisation, Otto Frank, which is a great honour and I am looking forward to working with Nigel and Chris soon. I’ll be able to tell you more about this film and my role in a future update. In the meantime for more information about Anne Frank and the work of the charity set up in her name, visit their website. Lately my life has been dominated by rehearsing and appearing in Frame 312 at Bolton Little Theatre, which ran from 11-18 October 2016. I played Mr Graham, an editor at LIFE magazine at the fateful time when John F Kennedy was assassinated in Dallas, Texas. It proved to be a very challenging rehearsal for everyone, including the director Peter Scofield, but the result was a production that had a fantastic reaction from the audience. Want the reasons I had wanted to be cast in this play it was a serious drama and I was keen to play a straighter character after my last three stage roles had been buffoons of one kind or another. This turned out to be a bit of problem because my usual comic instincts when it came to delivering lines had to be suppressed. Also I could not hide behind bluster and hesitation when remembering my lines. Learning the script was surprisingly hard this time. After learning Bob Acres at a run when I was emergency cast in The Rivals, I had gone into this play fairly confidently, however my confidence was soon shot as week after week my mind went blank in one place or another. I’ll admit that moving naturally on stage has also been one of my weaker areas. I’m a much more confident voice actor. There’s a real art to moving in a way that complements the lines and keeps the action visual, without looking too contrived. It is something I would love to workshop in the future. For example the director was keen for me to walk to the door and lean casually on the frame whilst talking to Young Lynette, but I never seemed to be able to reach the door and recline in anything like a relaxed way and ultimately I dropped it for merely moving about halfway to the door before turning. Another problem was that almost every acting choice I made was over-ruled by the director and I was unable to convince Peter that my take was better, which I made me annoyed with myself. I had some pretty dark moments this last two months went I felt that I wouldn’t act again after this play. Suddenly it seemed to have become much harder and I was only playing a fairly straightforward character, who doesn’t have that much of a journey compared to the lead. Mr Graham was a good newsman, intelligent, cynical and caring about others, if somewhat condescending. Initially I thought he would be quite buttoned down but rightly I was told to increase the amount of emotion in my performance since it would be too de-energised for a whole play. I also learnt a handy shortcut when playing with an American accent, change t’s to d’s and pronounce “new” as “noo”. Now I was not the only actor who struggled with the lines on this play, I think the whole cast seemed to have a bit of malaise for the first eight weeks. I discovered that my co-star in most of our scenes was far less experienced than I thought, and she was having an especially hard time. I wish I had known earlier on because I think I would have taken more of a lead and made sure we were in the right place at the right time for our entrances, perhaps done extra line-learning too. As it was, the part of Young Lynette was recast just a fortnight before the show began. Kimberly Armston did an amazing job stepping up to take on the complex role of Young Lynette in such a short time and our scenes together became so much easier. Finally my own line remembering clicked in, even though I never managed 100% on any night, but then that’s usual for me. Kimberly Riley-Shipperbottom also did sterling work taken on the extra role of Maria, Old Lynette’s materialistic daughter-in-law. I described Frame 312 as a play about the JFK assassination to friends and family but really it is as much about the corrosive effect of conspiracy and paranoia, both on one woman and on society as a whole. There’s a wider theme about the emptiness of the American Dream. Both Lynette and her son Toby are pursuing that image of a big house with 2.4 children, with nothing but the best. Lynette has long since realised that such status symbols do not bring happiness, whilst Toby is in denial. Meanwhile, whilst we see the drama of the conspiracy unfold in 1963/64 and the evidence mount up, in the end Keith Redfen’s play concludes that in the end conclusive proof does not matter. The most of the world knows that Lee Harvey Oswald did not work alone, that elements in the government covered up the successful murder of a president, but it keep turning anyway. Nothing will change now. I am very glad that the production finally took off in the those last two weeks, with extra rehearsals and a lot of work from everyone. Jeff Lunt and Joylon Coombs did a marvellous job with the two time zoned set and the atmospheric lighting was perfect. The whole cast really came together and supported each other. We’ve had some lovely feedback from the audience. At the opening night, most of the evening performances were half-sold but almost every night we played to nearly full houses, indicating good word of mouth. I have not got any more acting lined up for the time being and I’m actually quite glad, because of the hard work this one turned out to be. For now I shall be working behind the scenes and I am currently planning the stage movements for Wyrd Sisters, my next directing assignment. I’m write a separate piece about my preparations soon. Then there is the box office and marketing at BLT, plus some long overdue writing projects. In meantime Bolton Little Theatre’s next production is Witness for the Prosecution. You can find out more about it on the website. Here’s the video teaser I created for it. Thanks for reading and more news soon. Bolton Little Theatre’s latest production is “Dinner” by Moira Buffini. As with many of her plays it is concerns a set of apparently sophisticated liberal characters brought together in a room. Slowly however their veneers are stripped away to reveal ugly prejudices and other basic flaws and deceptions. In the case of this play, Lars a bestselling author of self-help books and his wife Paige are holding a small dinner party to celebrate his latest publication. But it soon becomes clear that Paige intends this evening to be an elaborate revenge against a group of people she despises for their hypocrisies. Somehow, the mysterious silent butler is the key, but what is his ultimate role? I have made a short behind the scenes documentary to promote the play, which is being staged 6th to 9th April 2016. For tickets and more information please visit our webpage. Bolton Little Theatre’s next production will be Richard Sheridan’s famous comedy about a clash between greed, snobbery and romantic ideals in 18th century Bath. The play is most famous for giving literature one of its most famous comic characters – Mrs Malaprop, a rich pompous dowager who frequently mangles the English language as she lectures all and sundry. “She’s as headstrong as an allegory on the banks of the Nile!” Sheridan probably based her name on the French phrase “mal a propos” meaning “poorly placed”. Although many comedies had used mixed up phrases before this, including Shakespeare’s, malapropisms has become the popular description of such jokes. Hope you find it interesting. “The Rivals” is on 5 – 12 March 2016 in Bolton. You can book tickets and find out more from the website by clicking here. 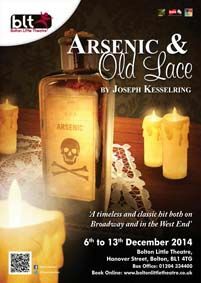 I’m shamelessly plugging my upcoming appearance in “Arsenic and Old Lace”, the classic American black comedy by Joseph Kesselring. I’m playing Dr Herman Einstein, the plastic surgeon and cringing henchman of the fiendish Jonathan Brewster. Armed with a comic German accent, I’ve been part of a hard working cast of actors and technicians at Bolton Little Theater and the rehearsals have been busy but rewarding. It’s a play that combines slapstick of hiding dead bodies with some sharp satire on the hypocrisies of the monied establishment. The Brewster sister are hailed for the good works, but they are shown to be rather prejudiced as well as murderers. Their money and position means that the police treat them with rather too much respect. Although we are a British theater troupe, we are playing with American accents, because somehow the comedy just doesn’t work without them. This play is both timeless, yet fixed to a specific place and time. Expect some production photos in a little while.